The author’s encounters with Musk over the years are a highlight of the book. He also does a good job of describing the battle between SpaceX and United Launch Alliance (ULA), as well as ULA CEO Tory Bruno’s efforts to make the former monopoly a competitive company. While Cape Canaveral is a popular tourist destination, many of the other places Pappalardo visits are not. Tourists don’t visit towns like Mojave, Van Horn and McGregor so much as pass through them, stopping just long enough for food, fuel and a bathroom break before hitting the road again. Pappalardo captures the bleakness of these communities, whose remoteness, sparse populations and cheap land make them good places to test rockets and experimental spacecraft. This contrast of high technology and low-rent surroundings is a stark one with which I am well familiar. The author’s account of a FAA hearing over whether to designate Mojave Airport as a spaceport is very interesting as various folks I know out here spoke out on behalf of the plan. I was not here for that event. Unfortunately, the author makes a number of factual errors about Mojave. The most glaring is when he recounts how SpaceShipTwo roared to life over the spaceport seconds before it broke up during a flight test on Halloween 2014. Good God, no! That would have risked showering the spaceport, town, schools and two busy highways with debris. The actual flight took place over the desert about 20 miles north of the spaceport. Even with that more remote location, debris narrowly avoided hitting two truck drivers. 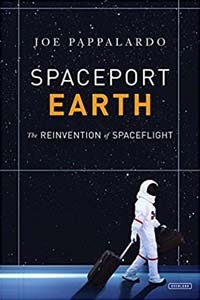 Pappalardo recounts the accident not from Mojave — where it left everyone reeling — but two states away in New Mexico where the setback caused yet another lengthy delay in the start of space tourism flights at Spaceport America. The distance mutes the drama of the fatal crash. The author’s lone trip outside of the United States is to French Guiana. There he views an Ariane 5 launch with VIPs, goes on jungle patrol with the French Foreign Legion, and hoists a few at a local bar. It is in this section that Pappalardo’s eye for the disparity between high-tech and low-rent fails him. There’s little hint of the poor economic conditions and bleak prospects in this French overseas department that led to a general strike that shut down Europe’s only orbital spaceport in 2017. He confines the uprising to a footnote. But, then again, this is a travelogue. They are supposed to focus on the positives. In this regard, the book succeeds fairly well. It’s worth a read.